What I find most interesting about this passage isn’t the jack-of-all-trades-and-songs that Erdman projects onto Blake. Instead, I’m interested in that last sentence: “the particular shapes and colors of his images of wonder.” This phrasing gets me thinking about two related ideas. The first is a traditional (albeit waning) Western tendency toward privileging the subject. And by subject I mean a thinking entity separate from its context, and in some thinking, separate from the body (also waning). This passage reveals an assumption that somewhere inside Blake these crazy and beautiful and genius visions resided. Not necessarily AS Blake, but at least belonging to Blake. In this sense, the tools of typography and printing that Blake had at his disposal were merely mechanisms in the service of somehow prying these images/ideas out of Blake with as much veracity as possible. The ideas, then, must come before their instantiation in a medium. The medium and processes are evaluated in terms of how little they distort the original images in Blake’s head. Those ideas seem a little dated now, sure, but I think Erdman is opening up an interesting discussion about what happens when one person (or at least the fewer the better) has control over large, continuous portions of the production process. Instead of musing on the ‘precision’ of Blake’s renderings through his own materials and process, it might be more interesting to think about them in terms of unity. Not unity in a literary or aesthetic sense, either. There’s an implicit given in Erdman’s argument that putting pen to paper to produce language or image is somehow compromised as those material are handed off to another person or team to be set into production. I would actually agree with this premise. I don’t agree with Erdman’s suggestion that because Blake took care of most aspects of production himself, the works were somehow “direct” and “final” and “fully” Blake’s. As a producer of digital texts, I know that there’s no tool, no medium, no reader even, that will allow access to the ideas in my head. For one thing, while experienced as images, sounds, and various sensations in my own head, the experience is virtual. Non-material. But the thoughts/ideas themselves are far from virtual. They’re what can affectionately be called wet-ware. Brain matter. Synapses firing in chaotic chemical environments. There’s nothing that exists which will get a reader from one to the other. Likely, there never will be. Thus, we’re stuck with media. Yay! I love media! What’s cool about a medium is that when you try to instantiate an idea in one, it never fits. I would argue that it’s never really close. So the idea has to change and the medium changes in my hands along with it. The idea starts to become ABOUT the medium, to the extent that the medium has only certain affordances. There’s a relationship between the two. Reciprocal. The tools, materials, ideas all get mixed up in this fluid relationship known as process. But Blake’s tools, materials, processes were not all his own. Each of them, too, was designed. By someone else. You can follow this back as far as you want to go. The plates are designed. The paper. The inks. The carving tools. The presses…. The paper produced with certain custom chemicals, manufactured screens and dryers and cutters, and likely included some cast-off manufactured textiles. Any way you trace it, there’s a constant divergence of processes. Even back to the most basic of resources, those resources still must be harvested with designed tools. Tools. That’s really what shapes all of this. And thus, shapes all of the ideas that find commerce in our society. And yet, I still think Erdman is on to something important. Sure it’s an illusion to think that Blake had total control over his production process. And it’s an illusion to even consider that he could accurately represent his pre-material ideas. There’s something else that make’s Blake’s illuminated manuscripts so stunning. Not accuracy. Not precision. But singularity. And no, after all that, I’m not going to say that the singularity is total. But it’s there as an element. A poet has an idea. Writes it down. A printer presses many copies of the bound book. Is the book the poet’s? Is it the printer’s? I don’t want to talk about copyright or legal issues here. What I’m interested in, with this example, is a certain notion of authorship. Blake’s head. 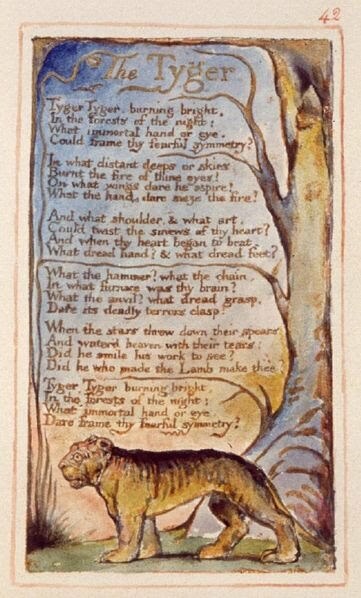 I would argue that the text is more Blake’s not because he rendered them without distortion, but because the process is more entirely his. It was BLAKE enacting that negotiation between idea and material. So that the product, for practical purposes was very much Blake’s. The book’s he produced represent the PROCESS of his idea/material/tool negotiation. I think responsible discussions of the book need to at least acknowledge the importance of this model of production. It’s much more complicated than this, but I’ll be working out more of these ideas later. There’s still no mention of systems of circulation, internal semiotics, or cultural function. Those later. I’ve got to start somewhere. I guess it’s here. With that question of “What is a book?”: an historically situated, paginated object that represents and has emerged from a recursive negotiation between socially produced ideas, materials, and tools. Hmmm. That’s a mouthful. Reminds me of an old aphorism (of which Einstein was especially fond): Any idea is only as true as it is simple. Or… You don’t really know something until you can say it in clear, simple language. Obviously, I’m not there yet. I still haven’t arrived at that point where I argue what this has to do with producers of digital media. Until then, anyone want to take issue with, add to, or clarify my definition? (I’m thinking the word “paginated” is going to give people fits first. Let ’em rip.